Among the most powerless men in the world are those in prisons. Your body no longer belongs to you; it belongs to the state. Every day you are told when to get up, when to go to bed, when you can exercise, when you can see your family, and also, when you can eat. Hidden within that last power of the state, however, is a weapon that Irish revolutionaries have used to resist. The state may say when you can eat, but you can say that you won't. On March 1, 1981, Bobby Sands, one of the leaders of IRA prisoners in Long Kesh prison near Belfast, refused to eat. He was a week short of his 27th birthday and virtually unknown outside of Ireland and Great Britain, but he was about to become one of the most famous men on the planet for refusing to do what most of us look forward to doing three or more times a day. By 1981, this one power of the nearly powerless had a long tradition in the history of Ireland's struggle against the neighbor who colonized her. The two most famous hunger strikers in Irish revolutionary history prior to 1981 were Thomas Ashe and Terence MacSwiney. Ashe, a veteran of the 1916 Easter Rising, was brutally force-fed and killed in 1917. MacSwiney's lingering death on hunger strike in 1920, and the worldwide condemnation that followed, is widely credited with helping convince the British to negotiate an end to the Irish War of Independence. In fact, he survived for 74 days. His death on Oct. 25 in Brixton Prison, in England, got the republican movement in Ireland more publicity worldwide than their armed struggle had ever garnered. The British so feared the power of the dead MacSwiney that they refused to allow his body to enter Dublin for what would have surely been a triumphal cross-Ireland return to his native Cork. But it was too late -- MacSwiney's sacrifice had dealt a fatal blow to the British occupation of Ireland. They would eventually agree to negotiate a treaty with the Irish that would lead to the 26-country republic. As MacSwiney had once said "It is not those who can inflict the most, but those that can suffer the most who will prevail." What occurred in the north of Ireland in 1981 would be the most famous use of the hunger strike in Irish history. As was the case with the hunger strikes in 1920, the object was the restoration of "Special Category Status" for republican prisoners. It had been taken away in March 1976 for those subsequently convicted. The first protest to this change by republican prisoners was the "Blanket Protest" -- wrapping themselves in a blanket rather than wearing the prison uniform. By 1978, more than 300 prisoners joined in that protest. the most who will prevail." In March 1980, the situation deteriorated when British officials announced that, as of April 1, there would no longer be "Special Category Status" for republican prisoners, no matter their conviction dates. In October, republican prisoners began a hunger strike they ended in December in response to an appeal by Cardinal Tomás Ó Fiaich, then Catholic primate of Ireland. Perhaps this gave the British government the impression that the prisoners could not sustain a hunger strike to the end when Sands and company began their hunger strike the following March. If so, it was a huge miscalculation. 5. The Right to one visit, one letter and one parcel per week. The date of the start of the strike, March 1, was choosen because it marked the five-year anniversary of the ending of the "Special Category Status." It is now believed that the IRA leadership outside the prison were opposed to another hunger strike following so quickly the failed one, but the prisoners insisted on going ahead. "I am standing on the threshold of another trembling world. May God have mercy on my soul," Sands wrote in his diary at the start of the strike. Later in March, Francis Hughes and Raymond McCreesh joined Sands on strike. Shortly after Sands' hunger strike was announced, there was an upsurge in IRA activity and in civil unrest, which garnered attention around the world, but a totally unexpected event would trumpet the news of the hunger strikes around the world. Frank Maguire, who was the Member of Parliament for Fermanagh / South Tyrone, passed away. Now there was an opportunity for an unprecedented publicity coup. Sinn Fein nominated Sands for the seat. His candidacy would gain the cause publicity, but his election would make front-page news worldwide. The other nationalist parties did not contest the election, giving Sands a clear path, and the Unionists ran only one Harry West, of the Ulster Unionist Party. In a constituency that was not dominated by either side, the election was a toss-up. On April 9, a nearly 87% voter turnout elected Sands with 30,492 votes to 29,046 for West. The nationalist neighborhoods of the north took to the streets in celebration, some of which ended in riots, but few of the celebrants could have been under any illusion that the British would allow Sands to enter Parliament, and they didn't. Parliament quickly passed legislation barring "convicted felons" from election to Parliament, just as they had done to former Young Irelander John Mitchel in 1874. This only had the effect of bringing Sands back to the attention of the world. 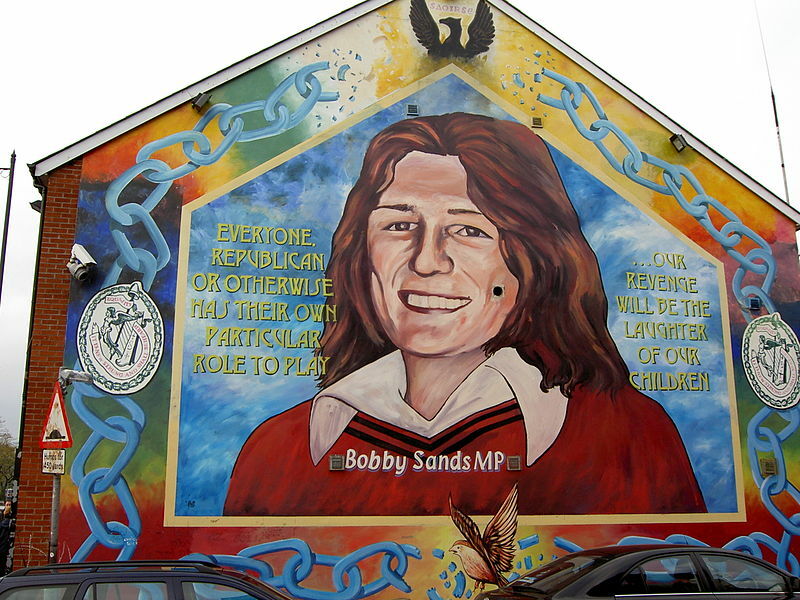 Bobby Sands lived less than a month past his victory - he died on the 5th of May. His funeral drew more than 100,000 mourners. Nine more hunger strikers would die after Sands. In order of their deaths, they are: Francis Hughes, Patsy O'Hara, Raymond McCreesh, Joe McDonnell, Martin Hurson, Kevin Lynch, Kieran Doherty, Thomas McElwee, Michael Devine. Though no one knew it then, the 1981 hunger strike would change the direction of the republican movement - not overnight, but ultimately it would transform it. In August, Sinn Fein ran Sands' campaign manager, Owen Carron, in the run-off for the same seat and he won. From here on the republicans would follow what came to be known as "the armalite and the ballot box strategy." That would lead directly to the "Good Friday Agreement" in April 1998, as Sinn Fein's "ballot box" portion of that strategy completely replaced the "armalite." The funeral of Bobby Sands. Gerry Adams is one of the pall bearers to the right in front. Bobby Sands mural on gable wall of Sinn Fein offices on Falls Road, Belfast. 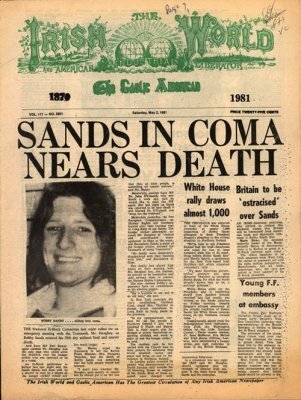 Headline from "The Irish World" as Sands approached death. 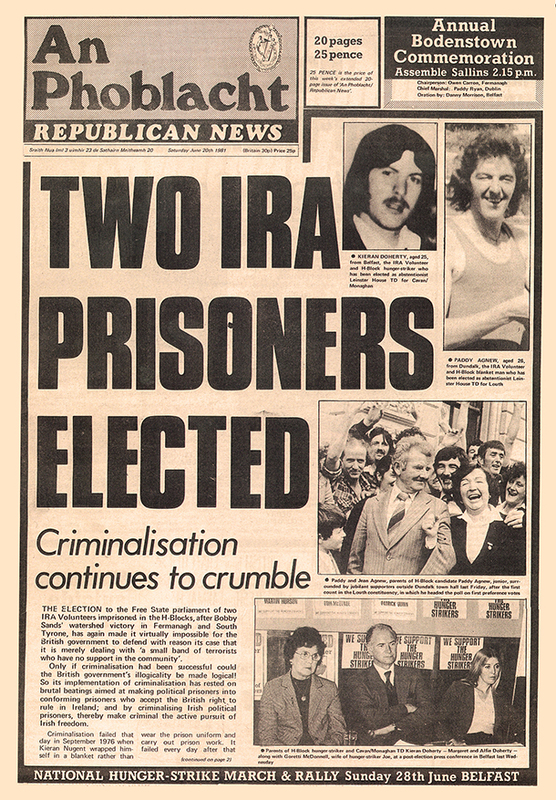 The front page of An Phoblacht after Bobby Sands and Kieran Doherty won election to Parliament. The Hunger Strikers who died. That is believing in your cause. Insanity or belief.